Yes, I know my little one isn’t in school yet, but he does absolutely love Go-Gurt. What kid wouldn’t love? It’s yummy fruity yogurt and you don’t even need a spoon to eat it with. Go-gurt was actually the first way I could get my son to eat yogurt. Maybe it was their fantastic marketing, or the clever way you eat it. I’m not sure, but whatever it was, it appealed to him. Here’s a great tip I learned from this promotion about Go-Gurt. You simply freeze it the night before and toss it in your child’s insulated lunch bag to keep things cool till lunch. The frozen yogurt will keep all the food fresh until lunch, and as it thaws to keep things cold, it will melt and be ready for your child to eat with their lunch. How cool is that? Now you don’t have to waste time and valuable space with one of those cold blue ice pack things. Go-Gurt is nutritious too, it contains a good source of calcium and vitamin D, providing a wholesome addition to a well-balanced lunch. It’s available in a variety of cool, fun flavors like Strawberry Splash and Chill-Out Cherry. You can download an .85 cent printable coupon here for Yoplait Go-Gurt. *This coupon offer for free Go-Gurt is not valid in some states, including California, Idaho, Louisiana, Minnesota, New Jersey, Nevada, North Dakota and Tennessee. 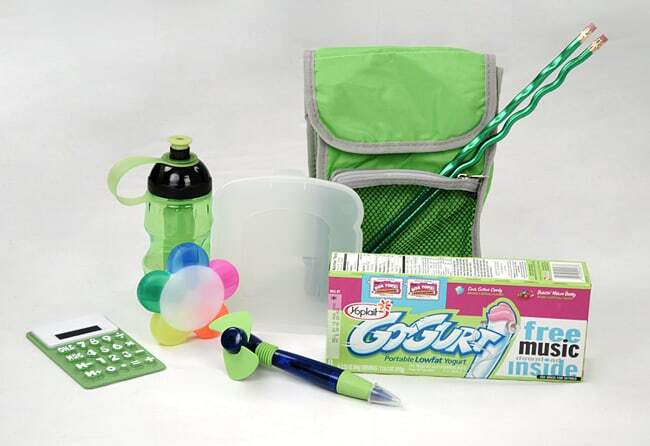 Here’s your chance to win the prize pack pictured below which includes an insulated lunch bag, a sport bottle, two cool pencils, a fan pen, a flower highlighter, a calculator, and a coupon for a free full size sample of the Go-Gurt pictured. Again, please leave an entry in the comments section below for each entry. Giveaway ends Tuesday Aug 17. Winner will be selected by Random.org Aug 18, and has 72 hours to claim, or another winner will be chosen. Thanks and good luck! Thanks so much to MyBlogSpark and Yoplait. Disclaimer: Yoplait through MyBlogSpark provided me with a free sample of this product and the prize pack pictured to review, and I was under no obligation to review it if I so chose. Nor was I under any obligation to write a positive review or sponsor a product giveaway in return for the free product. Kitchen Reveal and a Giveaway! Thanks very much for sharing how to keep food fresh until lunch time. Never thought of freezing the yoghurt for that matter. Brilliant idea, Angie! My kids like lemon Yoplait and strawberry banana. Freezing it is a great idea. GoGurt has an unreal amount of day-glow coloring in it or it used to so don’t send it with white clothes. strawberry is my niece’s favorite flavortoo…i would like to win this great giveaway for her…thanks!!! I am also a fan of eclectic recipes on FB!!! Thanks for the chance to win! I LOVE yoplait yogurt! My twins love strawberry yogurt. anything banana or raspberry goes over well in this household. and i love eating yogurt frozen now! makes for a special treat. to do not overlook this web site and provides it a glance regularly.